The Big News!!! | The Exchange | Get Life. Give Life. Did you hear the big news??? God continues to expand our family, so we’re making more room for you! 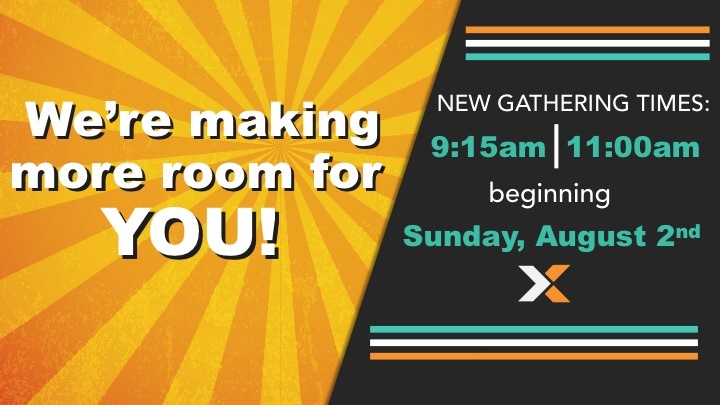 Beginning Sunday, August 2 we will have not one but TWO Sunday Gatherings at 9:15 and 11:00am. This will be an incredible opportunity to reach even more people in our area who are far from God! Begin praying now for who you can invite to be a part of what God is doing through The Exchange. Also this means it will take double the people “giving life” through serving to make Sundays happen. If you are interested in serving on our LittleLIFE (preschool), KidLIFE (elementary), Guest Services, Tech, Band, or Vocal teams please email us, and we will connect you with a team leader who can give you more information. Pray with us that God will use this opportunity to allow more people the opportunity to exchange their old life for new life in Christ and live out their purpose! » Blog » The Big News!! !